Most people wait to start their resolutions until New Year’s Day, but why not get a head-start on NYE instead? Get fired up for your festivities and ring in the New Year with a healthy and energizing start. This workout, which incorporates bodyweight movements and weight lifting, will burn out your muscles and get started on the right fitness foot for the year to come. Warm up by jogging or walking for five minutes on the treadmill. If you don’t have access to a treadmill, you can walk or jog outside. Alternatively, you can do 100 jumping jacks to get your blood pumping and your muscles primed and ready to go. 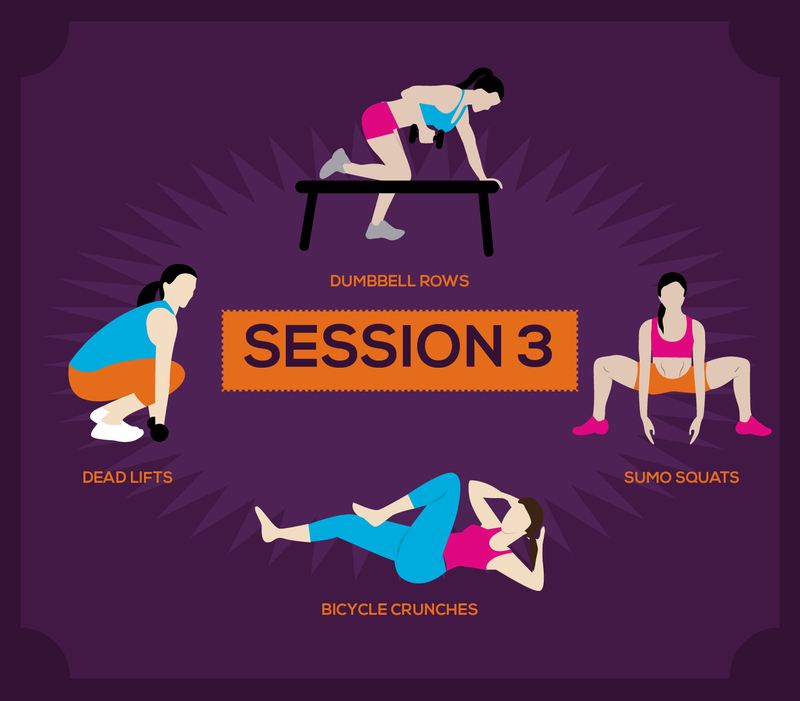 This workout is divided into three 10-minute sessions with a few minutes of rest in between each. Try not to rest for too long, so that you can keep your heart rate up. The actual workout will take about 30 minutes and about 45 minutes with warmup, cooldown, and rest periods. 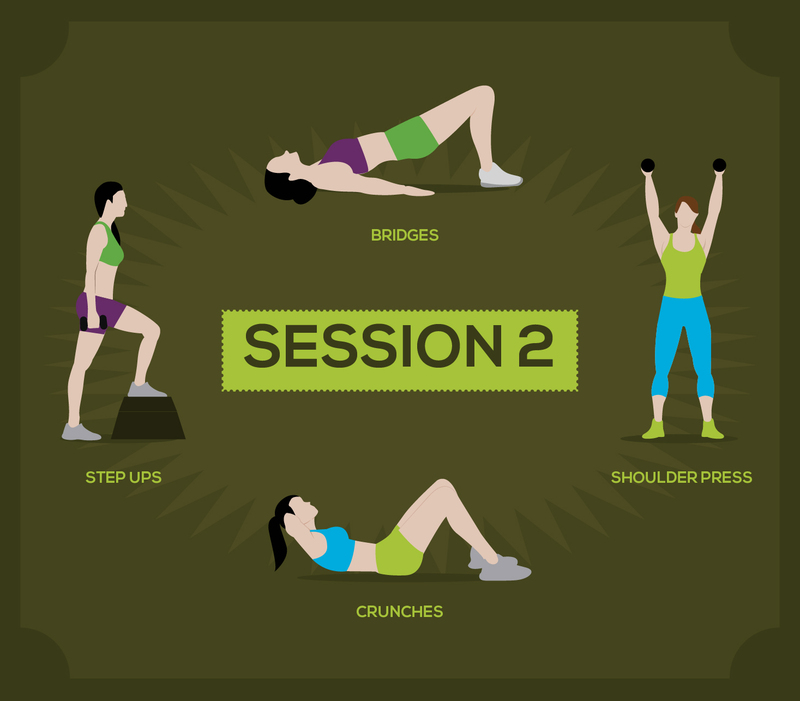 You will complete each session’s listed exercises in order as many times through as possible in 10 minutes. Of course, you can stop and take a break when you need to, but try to challenge yourself and keep your heart rate up. 10 Dumbbell Lunges on Each Side: Start by holding a dumbbell in each hand. Lunge forward with your right leg and keep your left leg stationary. Complete 10 on the right side before moving to the left side. 10 Push-ups: Begin in a plank position with your hands under your shoulders, back straight, and head in a neutral position. Lead with your chest to the ground and keep your elbows back at 45-degree angles. Once your chest reaches the ground, extend your arms back up into the start position. 15 Jump Squats: Start in a hip-width stance and sit back into a squat position. Explode up into a jump and then sit back into a squat. Keep this sequence going continuously. 10 Triceps Dips: Use a chair or ledge and place your palms on it with your fingers facing toward you. Bend your elbows to a 90-degree angle and then push back up. Make sure to keep your elbows facing backward. 20 Crunches: Lie down on your back with your knees bent into 45-degree angles and feet on the ground. Place your hands behind your head and crunch up with your core. Keep your head and neck in neutral alignment throughout the movement. 10 Shoulder Presses: Grab two dumbbells and place them at shoulder height. Press both up at the same time to full arm extension. Lower them back down to shoulder height for one repetition. 20 Bridges: Lie down on the ground and raise your hips up with your feet planted on the ground. Lower back down for one repetition. 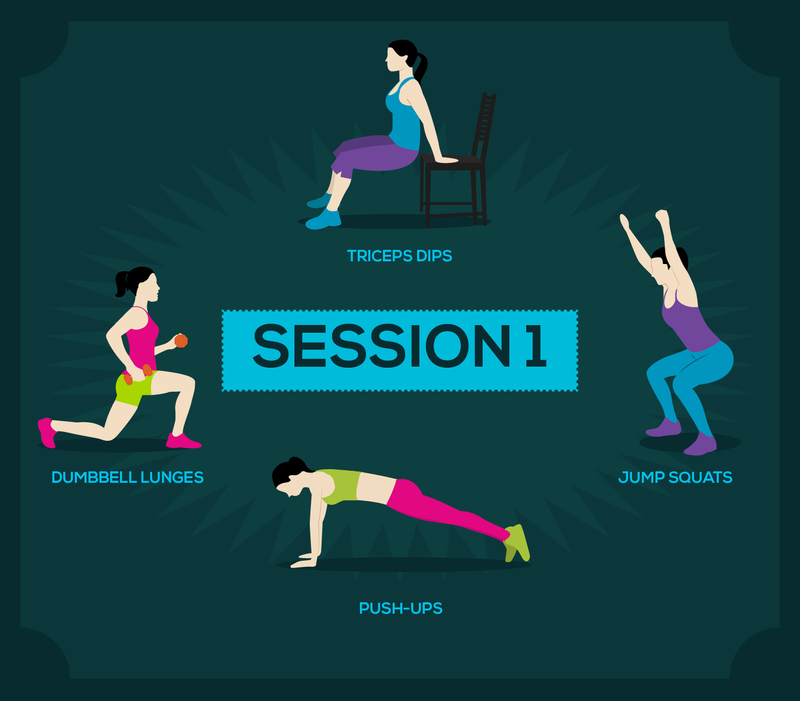 10 Step Ups: Find a chair or ledge for step ups! Alternate the leading foot when stepping up onto the chair. 20 Bicycle Crunches: Lie down on your back and raise your legs to a 90-degree angle. Place your hands behind your head and bring your right elbow to your left knee and then come to center and repeat on the other side. Alternate for the 20 repetitions. 10 Sumo Squats: Position yourself in a wide-leg stance with your feet pointing out to the sides. Sit back into a squat and the rise back up for one repetition. 10 Deadlifts: Grab two dumbbells and hold them out in front of you in a standing position. Slowly lower them down close to your legs and then bring them back up. Keep the dumbbells near your legs throughout the workout. 10 Dumbbell Rows: Keep your dumbbells in each hand and stand with your knees slightly bent and lean over with a straight back and neutral neck. Bring each elbow back holding the dumbbells and squeezing your shoulder blades together. End the workout by walking for five minutes to cool down and let your heart rate come down to an even pace. Follow your cooldown with some stretching routines. You are ready to ring in the new year with a healthy kick!